You can't run a tech company these days without infringing on someone's patents, and if you feel that you're infringee material, the Eastern District of Texas is the place to set up shop. SimpleAir, a Texas-based "inventor-owned technology licensing company," took Google to court over push messaging systems used in Android. Last month a jury found that Google infringed on all five of the asserted claims, leaving the company liable to pay up to $125 million for damages. Now we have a final number: $85 million. The math here is simple. 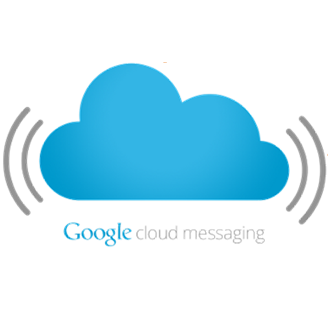 First, the jury found that Google's Cloud to Device Messaging (CD2M) and Google Cloud Messaging (GCM) infringed on all five claims made in patent number 7,035,914. Google felt it owed $6 million. SimpleAir demanded $127 - 146 million. Not wanting to go through too much trouble, they came together and settled on the average. Okay, maybe my math's a little off. Google's far from the only company SimpleAir has targeted. Previous lawsuits took aim at Apple, Microsoft, Samsung, and others. Regardless, Google's not out of the woods just yet. SimpleAir owns the patent until 2017, and damages for Google's ongoing and future infringements will be addressed in later proceedings. After all, SimpleAir doesn't want Google (or any other developers, for that matter) not to use its technology. The company just wants their money, and Google has tons of it. 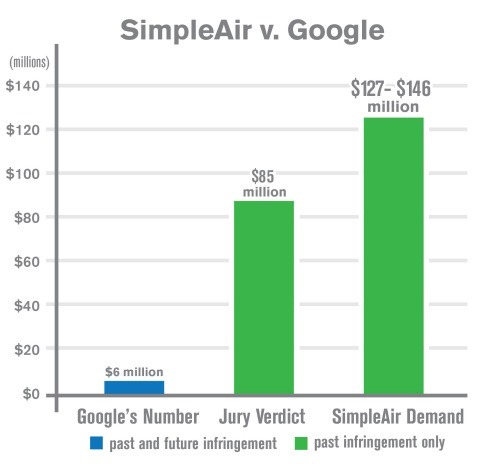 MARSHALL, Texas--(BUSINESS WIRE)--SimpleAir announced today that a federal jury returned a verdict that Google owes $85 million in damages for infringing SimpleAir’s U.S. Patent No. 7,035,914. A separate jury had unanimously determined in January 2014 that Google infringed all five asserted claims of the ‘914 patent and that each claim was valid. This trial was limited to the issue of damages and concluded on March 19, 2014. Both trials were presided over by the Honorable Rodney Gilstrap, U.S. District Judge for the Eastern District of Texas. The infringing services are the Google Cloud Messaging (GCM) and Android Cloud to Device Messaging (C2DM) services. The services are used by Google to process and send push notifications for Android applications such as Facebook, Twitter, and Gmail. In the damages trial, Google argued that it should only have to pay $6 million and that this amount should cover not just past infringement but all future infringement of the ‘914 patent, which does not expire until 2017. SimpleAir presented evidence that damages should be assessed between $127 million to $146 million for past infringement alone. The jury deliberated for less than an hour and returned a verdict that Google owes $85 million in damages just for past infringement. Damages for Google’s ongoing and future infringement will be addressed in future proceedings. The jury heard evidence that Google infringes the SimpleAir patent several billion times per day in sending push notifications for more than 60,000 applications on hundreds of millions of Android devices. “We expect a long road before we actually recover a single dollar from Google, but this is an important milestone along that road,” Payne continued. SimpleAir is an inventor-owned technology licensing company. SimpleAir has licensed its inventions to many leading technology companies. The company holds ten issued U.S. Patents and several pending patent applications in the areas of wireless content delivery, mobile applications, and push notifications. SimpleAir’s ‘914 patent, the patent that was asserted against Google, was subject to a Reexamination proceeding that concluded in February 2013 with all original claims confirmed. SimpleAir is represented by Greg Dovel, Jeff Eichmann, and Simon Franzini of Dovel & Luner LLP and by Calvin Capshaw, Elizabeth DeRieux, and Jeff Rambin of Capshaw DeRieux LLP.